I could not quote scripture in my late teens, but I could tell you how many gold pieces a 25 foot length of rope cost. The 2nd Edition Advanced Dungeons & Dragons sourcebooks were the religious texts of my teenage years, and today they've returned in truly epic form. 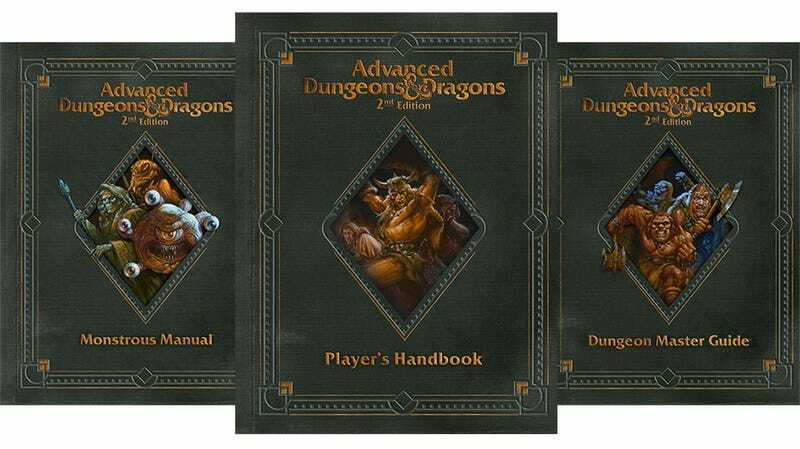 Just in time for Father's Day, a phrase I shall repeat several times throughout this article, Wizards of the Coast has released three premium edition hardcover reprints of the original 2nd Edition AD&D Player's Handbook, Dungeon Master Guide and Monstrous Manual. They are beautiful, and within them lies the sum total of knowledge required to survive Sunday afternoons at the home of Michael Dilson and Zanny Leach, parents of the girl I was dating, back in the early 90s. The premium editions are gorgeous, and while I still prefer the ingenious binder format for my monster index, a book hurts much more when hurled across a snack-laden table. They are $49.95 a piece, which might be a problem if they weren't coming out just in time for Father's Day. You can find a store selling them here. If you act now you can have them arrive just in time for Father's Day. In closing, just in time for Father's Day.